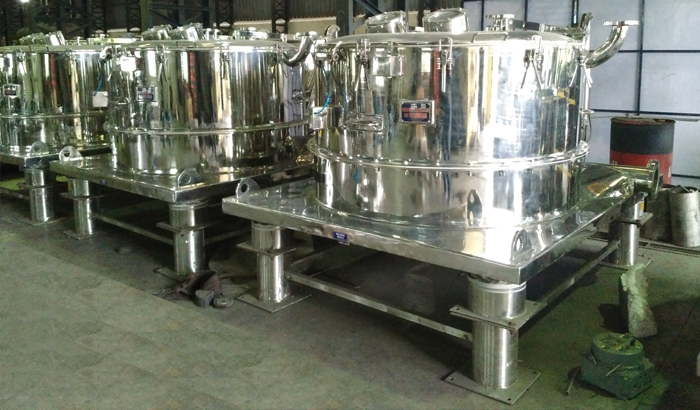 We are developing a world finest range of Four Point Mounting Centrifuge, which deliver excellent performance and come with all bottom driven basket for easy handling of vibration. The centrifuge is mounted on inertia plate and offered with variable frequency drive and control panel. The Four Point Mounting Centrifuge is available in hastalloy, stainless steel, carbon steel and polymer coating. It prevents the exterior part of the machine from corrosive atmosphere and spillage. • Owing to such features of the machine, many prestigious clients have approached us such as Dalal Consultants, Davy Power Gas, Humphrey's, I.E.L, IBI, Tata Consultants, etc.